When women suffer an ectopic pregnancy as the first pregnancy, the effect lasts a lifetime. Ectopic pregnancies occur when the fertilized egg implants in the fallopian tube. The egg splits and grows in a tight space until pain develops. If the pain is ignored, the fallopian tube can rupture causing extreme pain, internal bleeding and death, if left untreated. 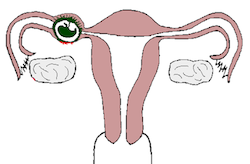 When an ectopic pregnancy occurs, the fallopian tube may be destroyed. The research study published in the journal Human Reproduction, is the first to look at the long-term impact of first pregnancy ectopic pregnancy on parenting outcomes. According to the researchers, women who experienced ectopic pregnancy got pregnant fewer times overall. However, the risk of a second ectopic pregnancy was up to 10 times higher in the study group when compared to women who did not experience a first pregnancy ectopic pregnancy. Researchers noted that women who experience ectopic pregnancy are often less fertile following the pregnancy. Impaired fertility could account for the difference in total number of children. The women were expected to try to conceive more often, but even trying to have more children did not make up the gap caused by the first ectopic pregnancy. On average, the women in the study group birthed one less child than comparable women who gave birth after their first pregnancy. One unexpected outcome related to risk of miscarriage and abortion. Women with first pregnancy ectopic pregnancy were 54% less likely to suffer miscarriage in subsequent pregnancies and 28% less likely to have an abortion. Can Ectopic Pregnancy be Prevented? There is no way to prevent ectopic pregnancy because there is no known definitive cause - other than narrow fallopian tubes, which is not a condition determined before pregnancy in most cases. Ectopic pregnancy can cause pain before pregnancy is even determined, so women of childbearing age, especially those currently trying to conceive, should respect any and all abdominal or low pelvic pain and seek medical attention if pain persists or grows worse. Source: Line Lund Kårhus, Pia Egerup, Charlotte Wessel Skovlund and Øjvind Lidegaard. Long-term reproductive outcomes in women whose first pregnancy is ectopic: a national controlled follow-up study. 10.1093/humrep/des375.